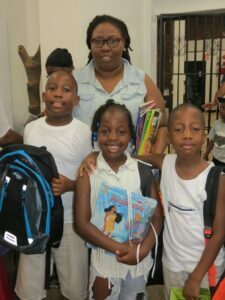 Organizers and volunteers of the Magnolia Tree Earth Center of Bedford-Stuyvesant collected donated school supplies and distributed them to over 80 young people from kindergarten to high school on Saturday, Sept. 12 at the 377 Lafayette Avenue home of MTEC. Organizers were: Joy “Ishine” Grey, Trina Malloy, Jacinta “Jazz” Fenton, Sanchia Vaughn and Andrea “Cuchy” Brathwaite. 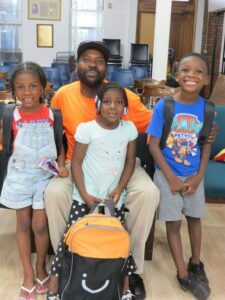 Volunteers: Marsha Pierre, Trevor Robinson, Claudette Spence, Aziza Clunie, Tahirah Powis, Michael Powis, Ansel Cridland, Tyisa Brathwaite , Rogelio Rook, Joe Morris, Brian Hooper and Brian Clunie.